Labor day weekend was coming up and I did not have a specific plan for this three-day weekend. I just had the idea that I was going to go for a long ride and would take my camping gear with me and that I would meet with my friends some where at some point. How this trip came about? With about zero planning. I was waiting for my friends in Portland to call me about where we would go for our annual camping trip. These two guys are like brothers to me. We know each other for many years, from the time we all lived in Columbus and were going to school at the Ohio State University. They and their families are my family here in the United States. 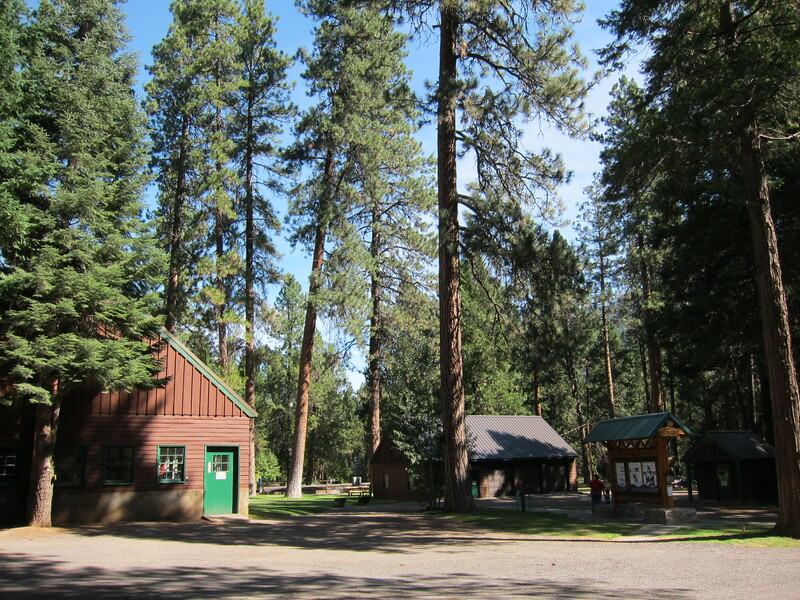 They called me Wednesday evening to let me know the location: the Metolius River, where we camp along the Metolius River, under the the aromatic Ponderosa trees, bordering the Oregon high desert. We had camped here in 2009, check here for that post. I was hoping and had been lobbying for something more radical and more distant for this trip. But they have kids, and toddlers at that, and I understand their priorities. So my plan was to add distance to the trip. So why not come back home via an alternate route such as the Crater Lake? That’s how this trip came together. This is one of two posts where I report the three-day weekend. 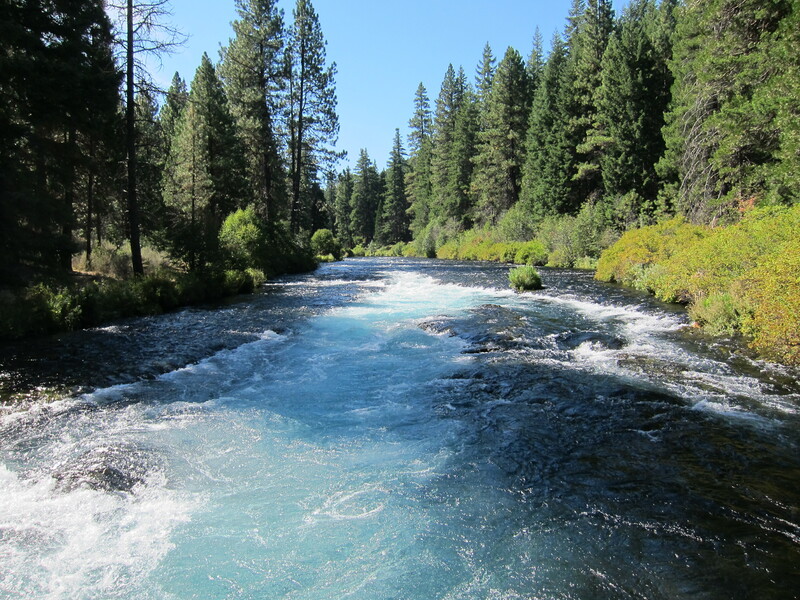 This post here is about the Metolius River, where I camped at the end of day one of the holiday. 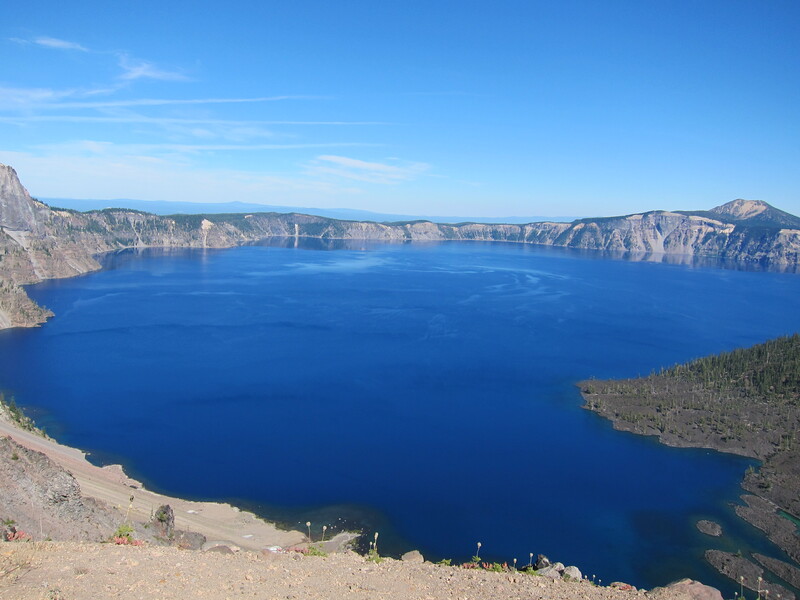 The second post will be about the Crater Lake, where I camped on day two of this mini-adventure. The only planning I had done before the call was to have my gear ready, including this important supply. 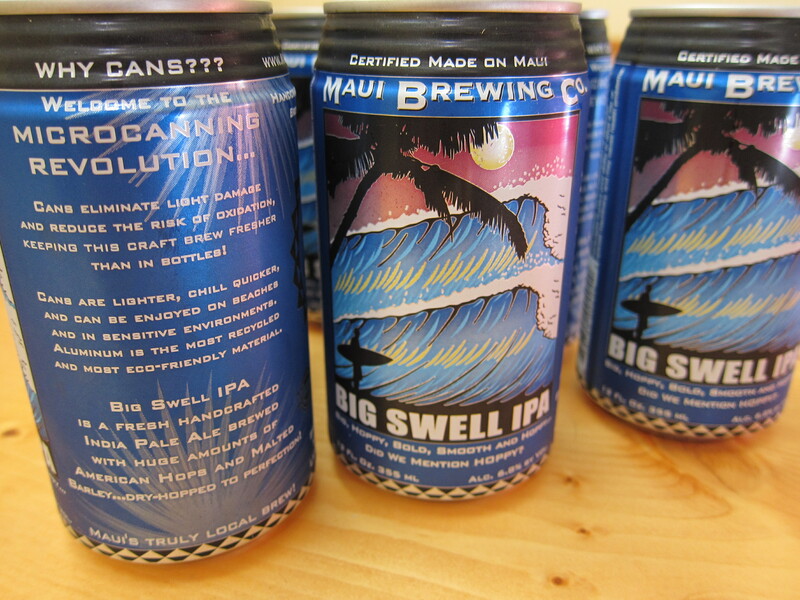 The story about the “Micro-canning Revolution” and its advantages convinced me, along with the Hawaiian theme on the drawing on the can. 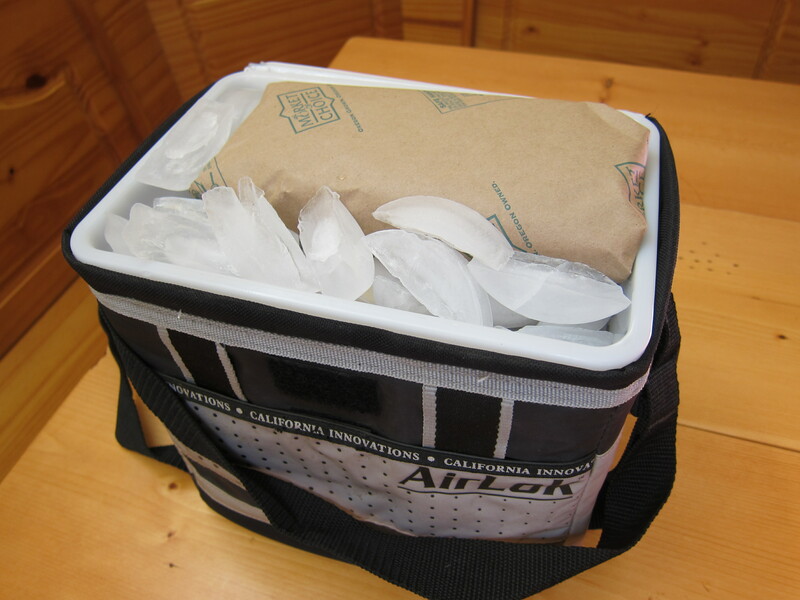 Beer and dinner, the important stuff all packed in my small cooler that fits in the central pocket of my Giant-Loop bag. The bike of choice is the Triumph. 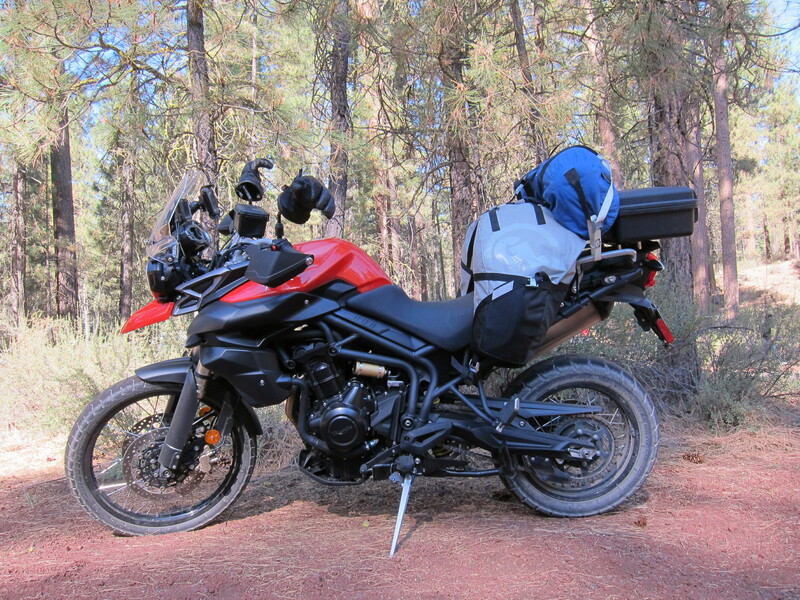 This machine is perfect for hauling all my gear and for long days on the saddle. 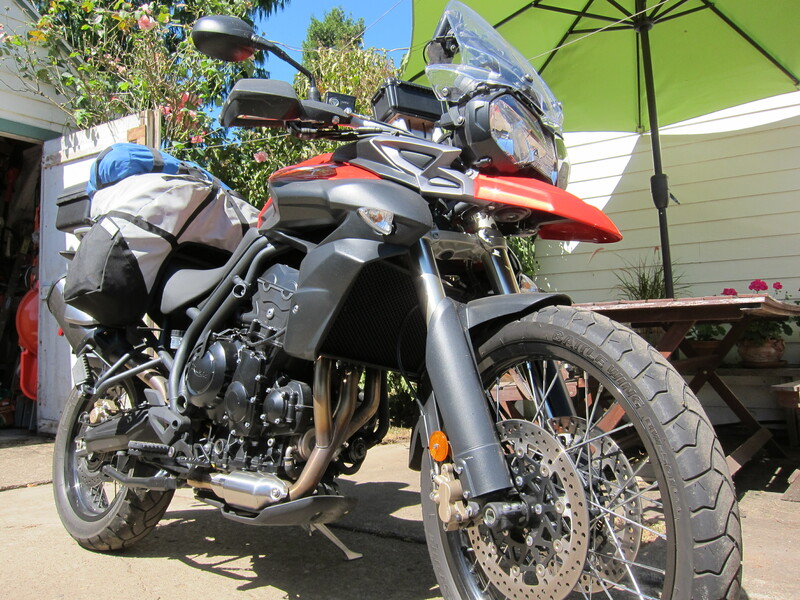 All motorcycle vitals checked, packed, the bike was ready to take me on this journey. 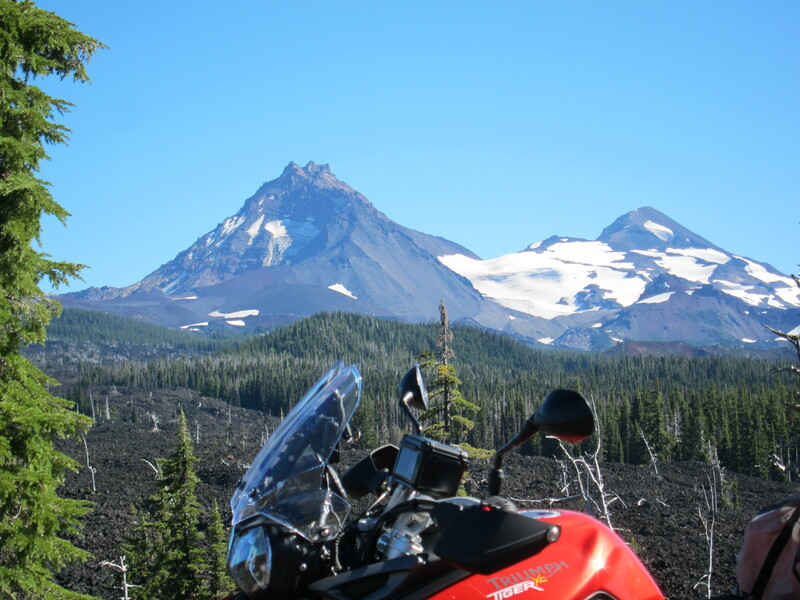 To get to the Metolius River I already chose a longer route via the McKenzie Pass. Now, end of the summer, let’s check the snow cover on the Sisters’ Mountains as viewed from the McKenzie Pass. The Ducati at that same location, July 4th, 2012. This is a great road for its many twists on the way to the top. 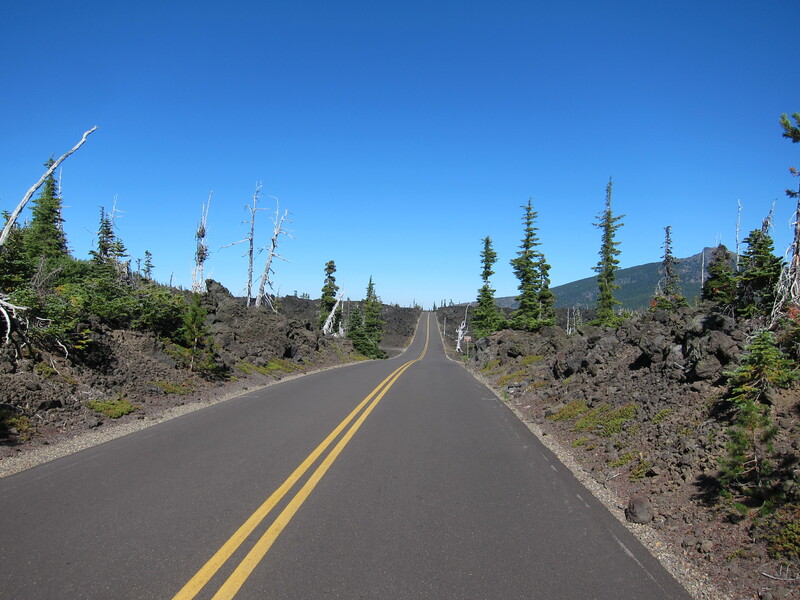 And I like the desolate landscape on the top of the pass, when we hit the lava fields. 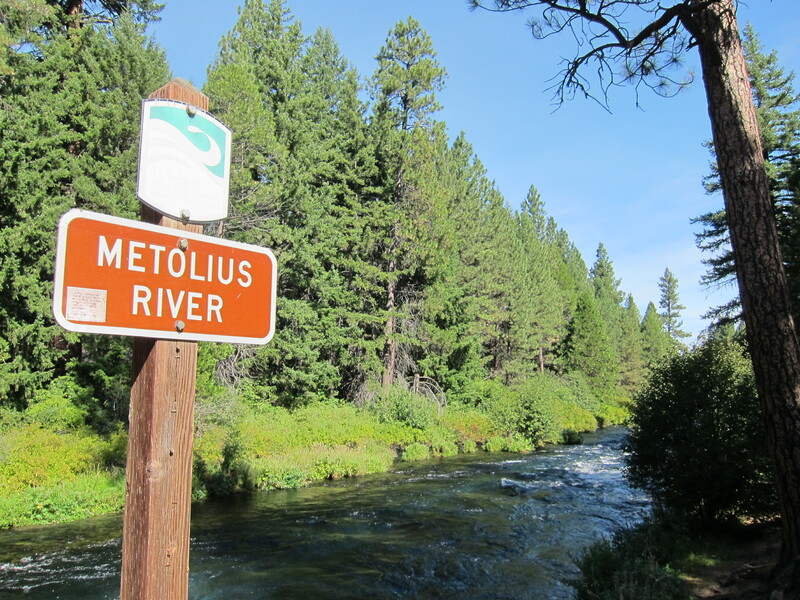 The Metolius River campgrounds are not too far from here. A few more miles on this road, down on the east side of the pass, I took the gravel road that is a short cut that connects with Hwy 20, and from there to Camp Sherman and the several campgrounds along the Metolius River. I was there in no-time, even taking the long way to get there. 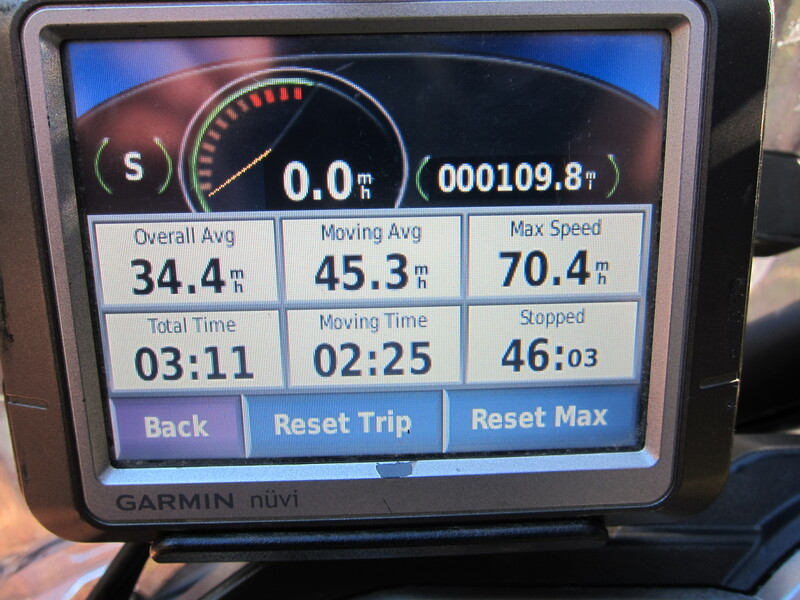 The total for day one was 110 miles (177km) from home, even going the long way it is a short distance. Set my tent, and played with the kids.They are into riding bicycles now and they love my motorcycle. How easy is it to become a hero to 3-4 year old kids? 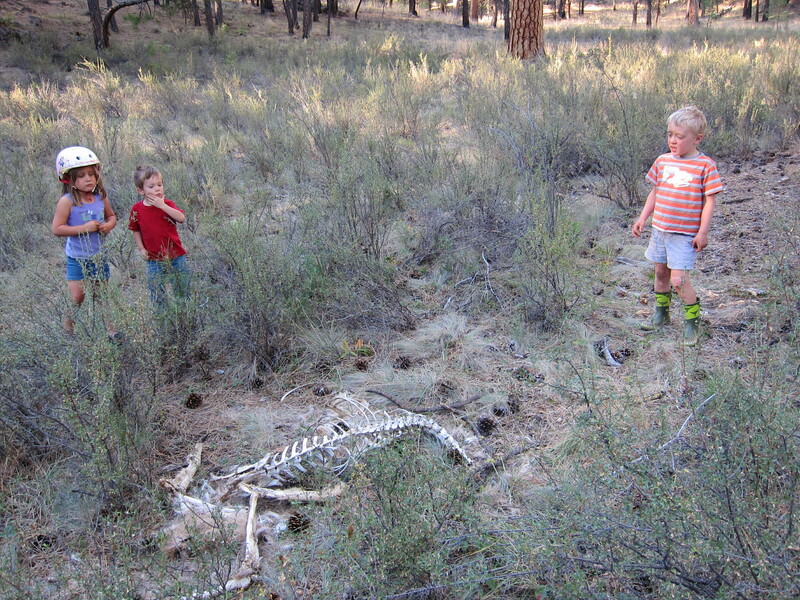 The first thing the kids wanted to do was to show me the dead deer. They took me on this path not too far from the camp to show me the deer. Their curiosity about it reminded me of “Stand by me” the film, that is based on Stephen King’s book “The Body” about four friends who embark on an adventure to see a dead man’s body (and which was filmed in Oregon, by the way, not too far from where I write this story here). So this dead deer the kids wanted me to see is a mini version of it. Check my take on Stand by Me here. Eventually I hope the kids will have a strong friendship amongst themselves like I developed with my friends, and that they have their own camping trip together at some point in the future where they can share memories of their past adventures via pictures like this one. And what about this fallen tree (cut after it died)? 525 years old. We were camped right next to it. It even had a plaque. Or two. 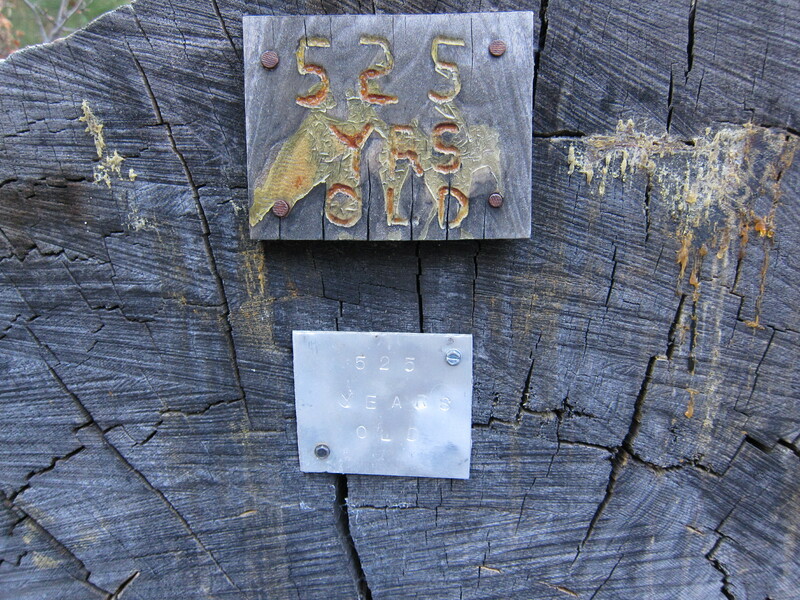 525 years old, it says. 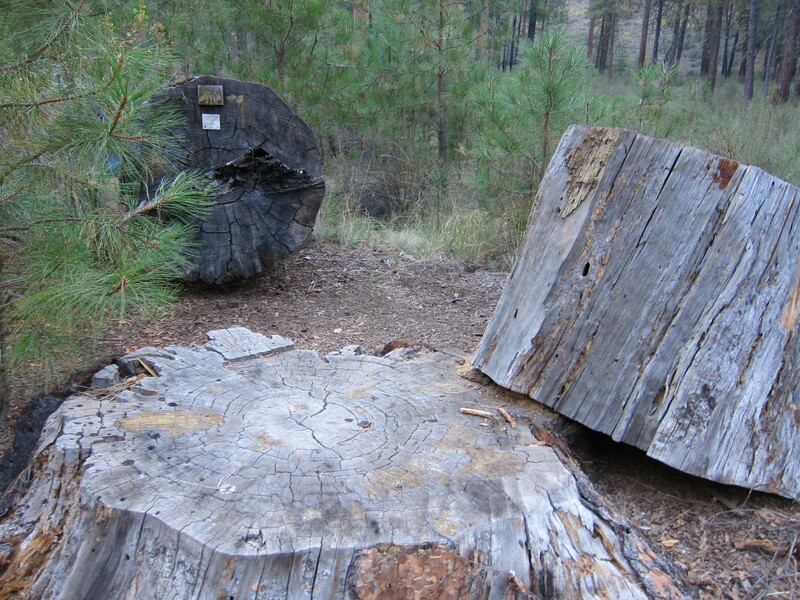 Can you read the growth rings and find out when Oregon had a long summer or when the summer was short in these last 525 years? 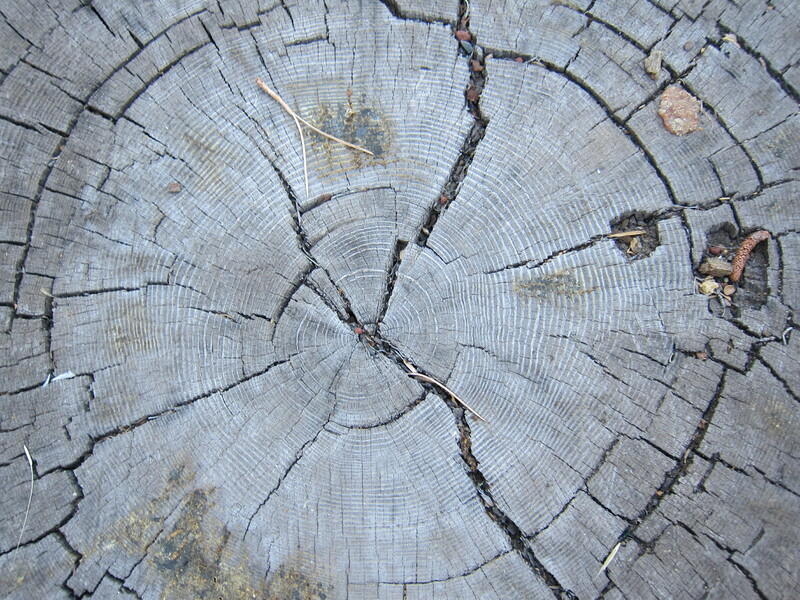 Check here for a Youtube video explaining how to read growth rings. Can you read the tree growth rings? Soon we had the barbecue going. These guys add Montreal sauce to their stakes. This is a long battle between me and them. I consider it a sin to add something with so much taste into a great steak which already has a great taste. It is too much distraction and diversion from what the steak has to offer. It is like drinking flavored coffee – if you do that, chances are you don’t like coffee very much, right? So I waited and cooked my rib-eye steak later, salt only! No pics, I was too hungry and the steak was perfect. Their steaks, sprinkled with Montreal. When everyone went to sleep, we, the three amigos, had our time for ourselves. We sat by the fire and had our conversation. Then I went to my tent for a good night of sleep. The temperature may have fallen to close to freezing at some point. It started well and I was comfortable and had a good sleep at first. But then I felt the cold. I spent a good portion of the early morning convincing myself that it would be all right; that it was better to stay like that than to disrupt the sleepy state I was in to find the clothes that would make me warm. This is not the first time it has happened where I find myself cold and not able to make the effort to get warm. Eventually I fell asleep again. The morning was still cold and until the sun made its way to the camp site we were all huddled around the campfire with a hot cup of coffee to warm our hands. 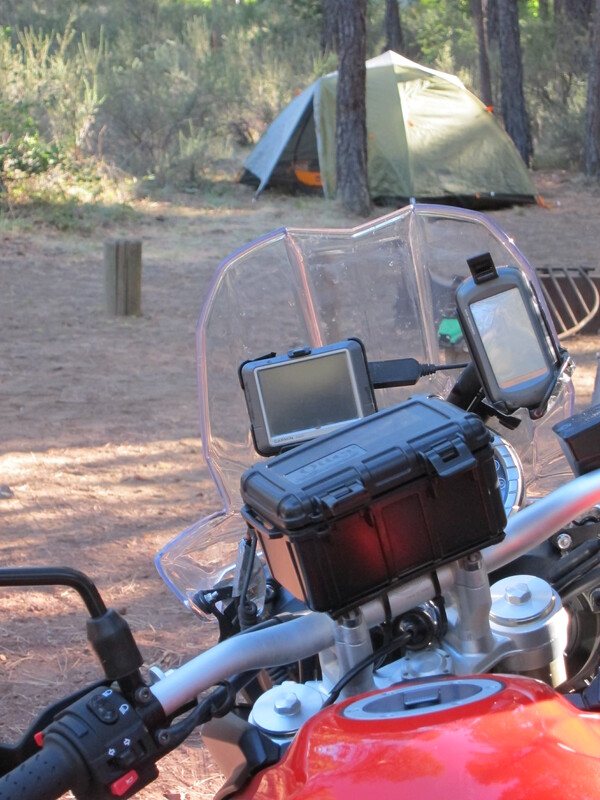 And I had my motorcycle gloves somewhere… After breakfast, tent is packed, bike is ready for what is next. 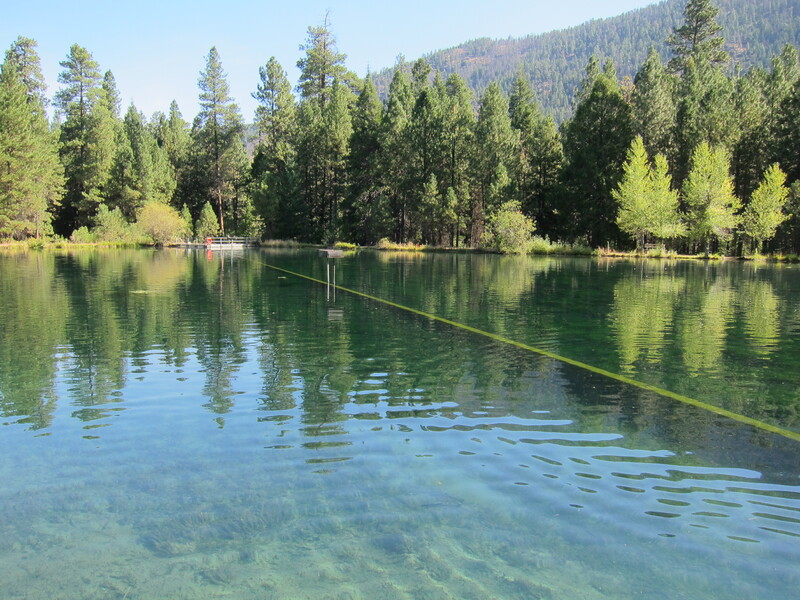 We lifted camp and drove together to the fisheries on the other side of the Metolius River. A campus like this is a traditional site in American parks. It represents 1950’s Americana in my view. This and the pine trees remind me of Walt Disney stories from long time ago. Mickey Mouse, my favorite cartoon character during my youth years had a few stories on comic books that took place on settings that looked like this, or this reminds of those settings. 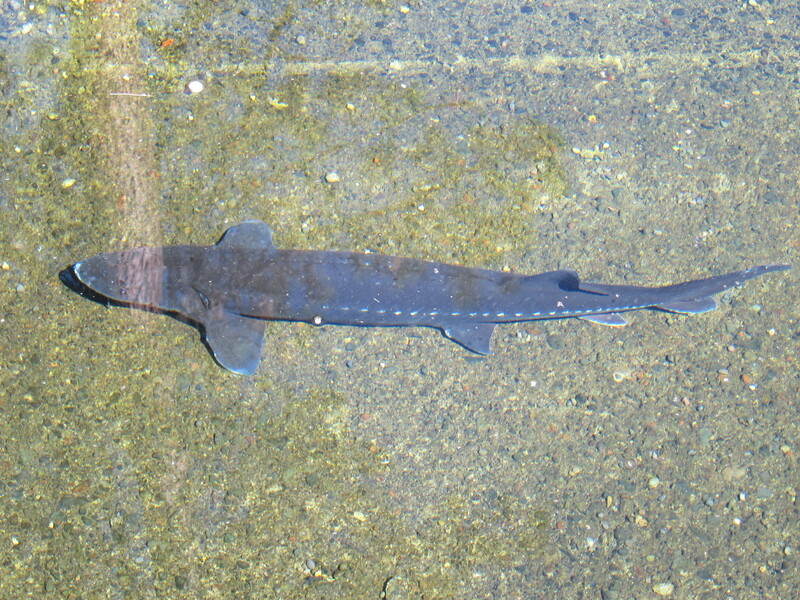 We checked the fishery tanks. 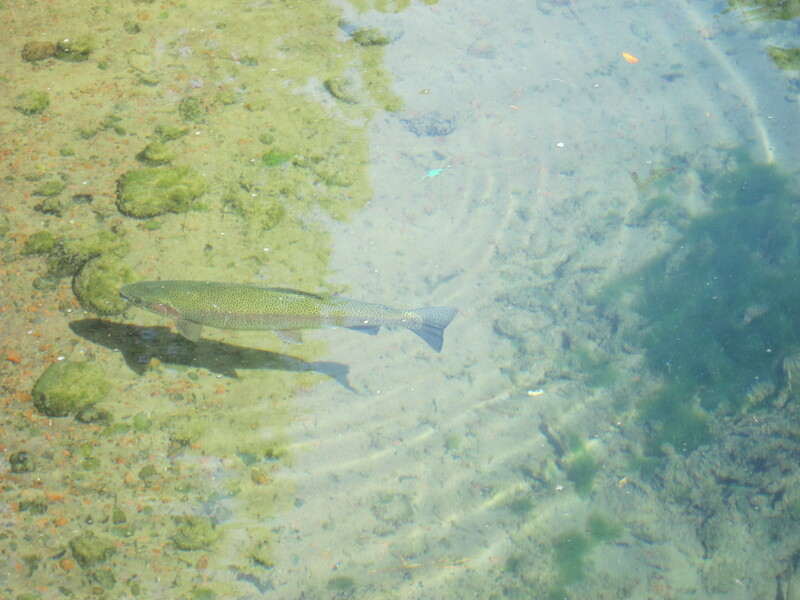 And the pond with Rainbow Trout. We said good bye at some point, already close to 11:00 am. 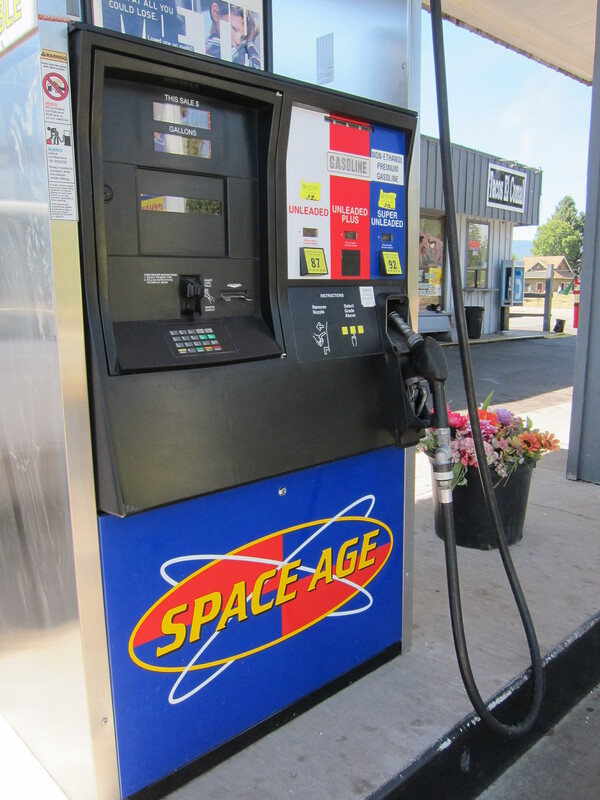 They went back to Portland and I went towards Sisters, to the Space Age gas station. I’m a regular customer when passing through Sisters. I like the looks of the pumps, and it has that non-ethanol premium gasoline. 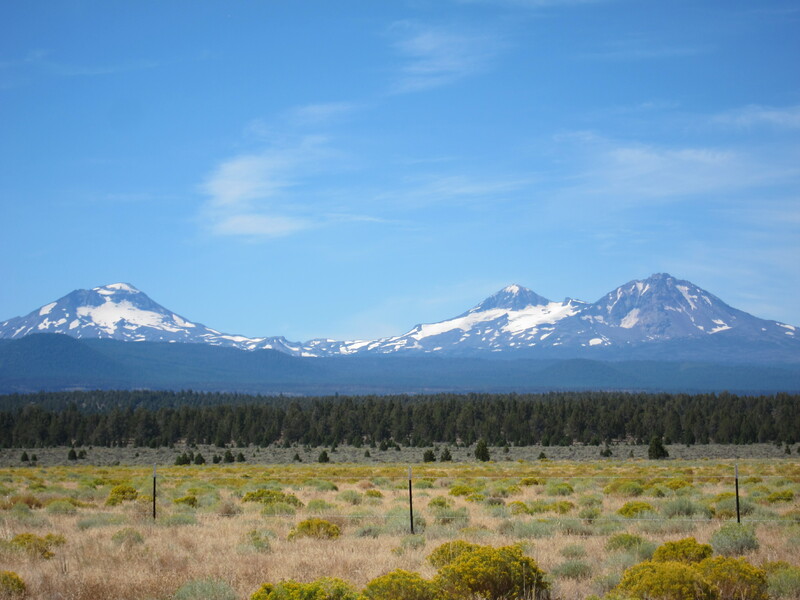 I left Sisters towards Bend and stopped to appreciate the view of the Three Sisters mountains from this other angle, where you can see the three of them. I have three sisters and I see it that they are taking care of me when I go by this region. 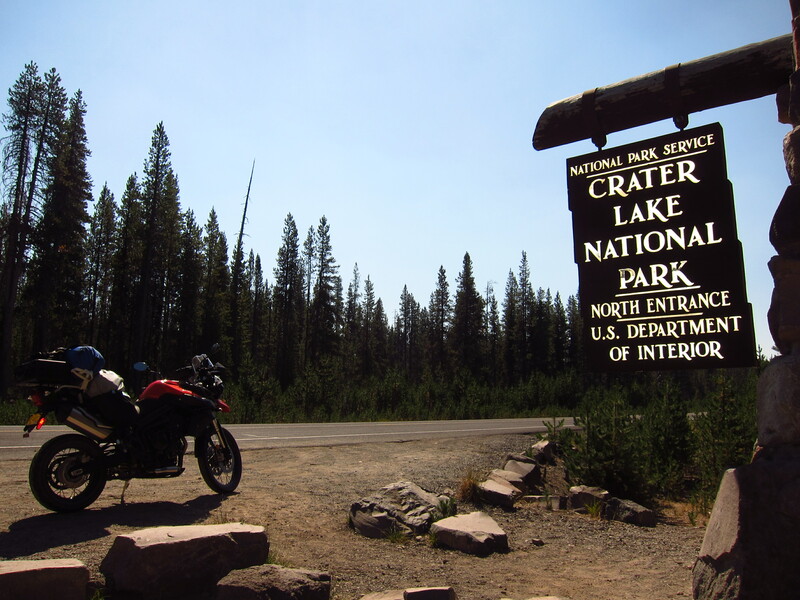 About 150 miles later I was at the North Entrance of the Crater Lake National Park. I had been here two or three times before. At each time I’m here I discover a new dimension to this park. 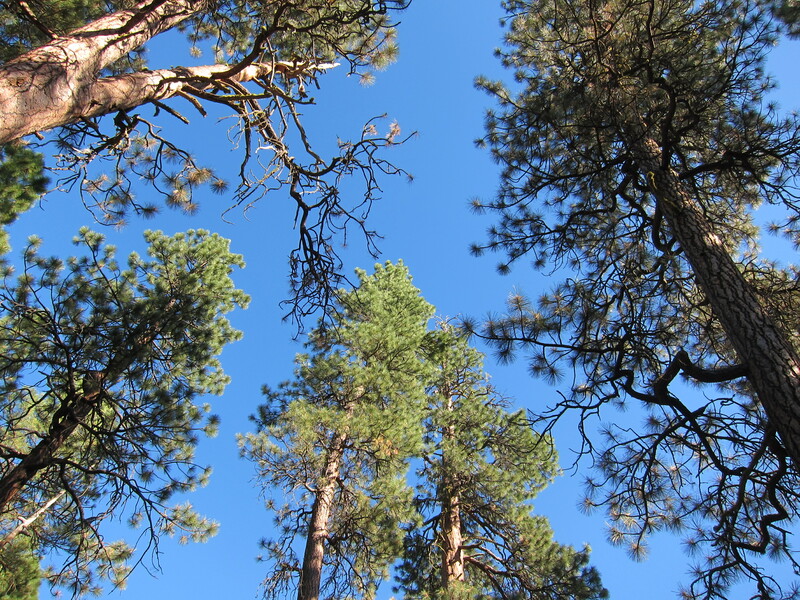 Check my next post, where I will document the rest of this trip, including a short tour of the Crater Lake Park. It’s nice when I see familiar scenes. 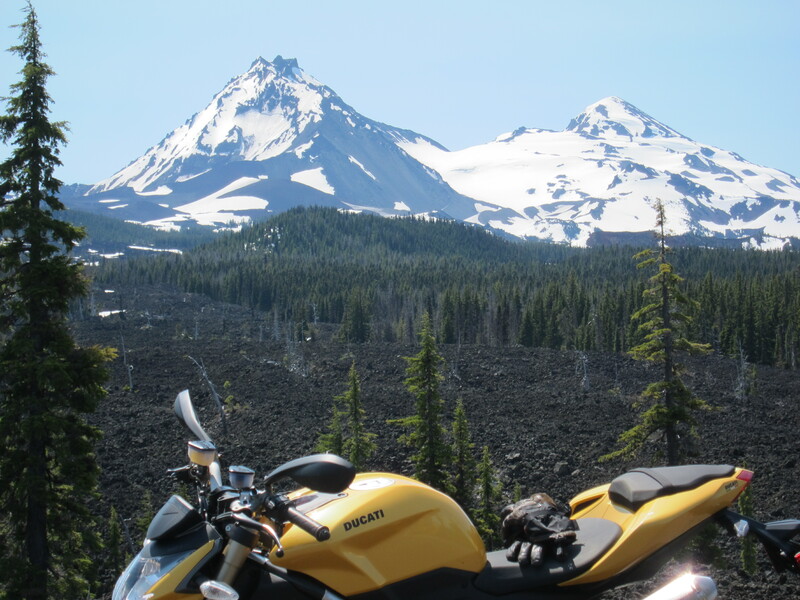 I rode through McKenzie pass when I was there during July. Somehow I must have passed those campgrounds, I don’t remember seeing them, unless they are just south of the Dee Observatory on the north side of the road. I was too busy looking at the narrow road. I agree with friendships that endure a lifetime. That day I was there was the evening that I spent in Eugene. I had no timetable, if you had posted this before, perhaps I could have camped there too. I edited the story so that the information about where the campgrounds are located is more clear. 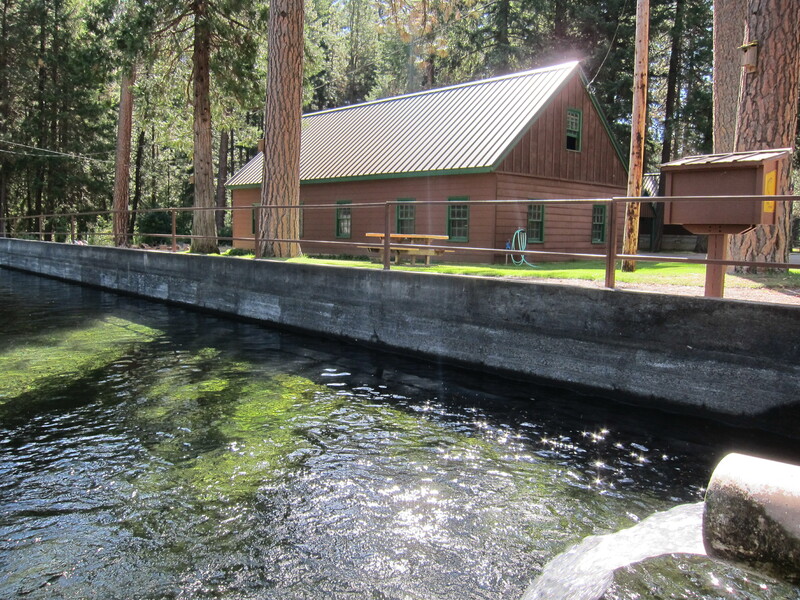 They are along the Metolius River, off Hey 20. Aside from my GF, these two guys are my family here in the US, they are like brothers to me. What a great trip so far. I enjoy reading your blog as I get to see sights I’ve seen before through a new perspective. Last August was the only time I’ve ever been to Crater Lake. 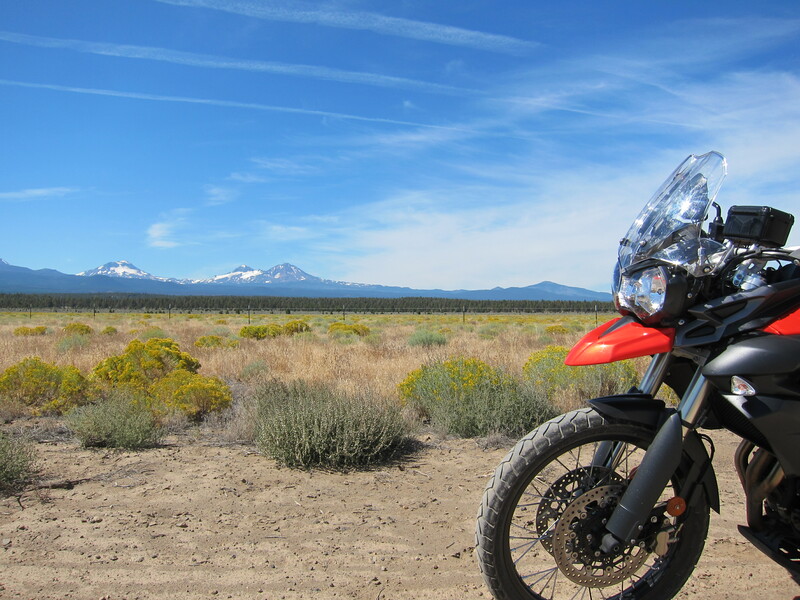 We moto-camped at the Farewell Bend campground and it was perfect. The next day we rode rim drive then came home via Hwy 138 and Territorial. Great post, great photos, great memories. 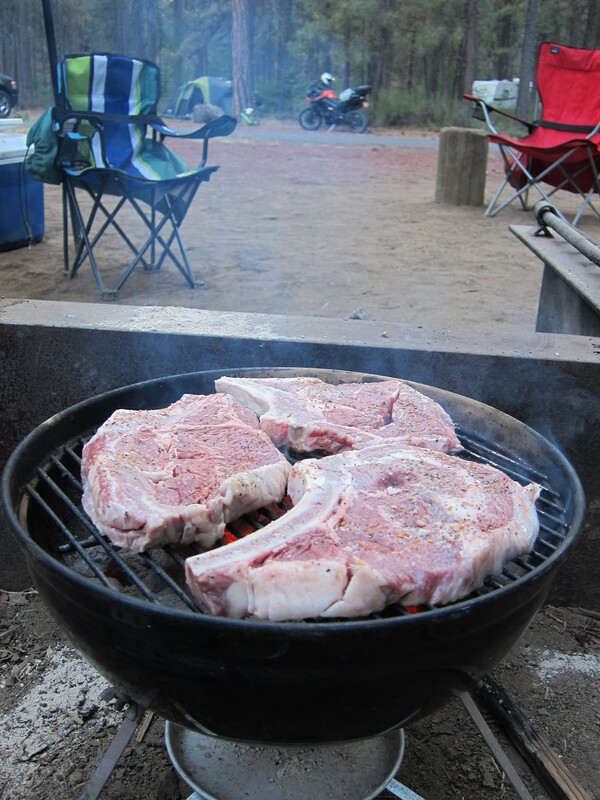 Looking forward to the next camping trip! Great to know you’ve been here checking my scribbles, stories and pictures! Hope to see you in the Holidays.